This course is designed to meet the GDC’s development outcome TBC and will qualify for 1.5 hours of verifiable CPD. 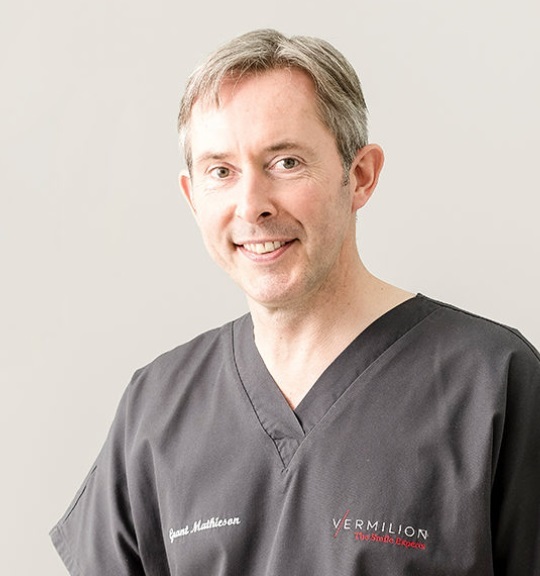 Grant Mathieson graduated from the University of Edinburgh in 1990 and spent the following three years in a variety of hospital-based posts in the UK covering all dental specialities, prior to a formal training pathway in restorative dentistry. In 1994 he became a Fellow in Dental Surgery of The Royal College of Surgeons of Edinburgh (RCSEd), followed in 1995 by achieving the Membership in Restorative Dentistry of RCSEd. Having acquired a broad based career, as well as teaching at both Glasgow and Edinburgh Universities, he was recognised as a specialist in prosthodontics by the General Dental Council in 1999, and continued to provide restorative care for patients in private practices in both Edinburgh and Glasgow along with part- time teaching positions and NHS Primary Dental Care. In 2004, Grant was appointed as a consultant at Zayed Military Hospital in Abu Dhabi, United Arab Emirates. This post involved all aspects of restorative dentistry, with particular emphasis on the treatment of the failing dentition, tooth wear and implant based care. During this spell he was also Regional Dental Adviser for RCSEd and achieved accreditation for the department along with organising the inaugural MFDS examination in Abu Dhabi. He continues to be actively involved as an examiner with the RCSEd for both the MFDS and MRD examinations in the UK and abroad. He enjoys building effective partnerships with dental practitioners and have an excellent working relationship with practitioners in Edinburgh, where he is based, and throughout the UK and abroad. His current post in this specialist referral clinic involves close collaboration with colleagues and development of prosthodontic techniques including immediate loading of implants and 3D scanning with an emphasis on digital workflow. We are collaborating with the University of Ghent to collect and analyse patient data in relation to immediately loaded full arch removable implant prostheses. He has continued to work one day per week at Glasgow Dental School with supervision of undergraduate dental students. This post involves small group teaching and seminars with a variety of teaching methods being introduced. He also has experience with the assessment of undergraduates using the iPad based Lift-up system. As a specialist with many years of experience, Grant is well positioned to provide mentoring to undergraduates and young graduates as they make progress in the early stages of their careers. Vermilion actively encourages dental students to visit and observe along with a number of BDS 4th year students completing an elective period of study. He continues to be actively involved in practice based research and audit along with the delivery of continuing postgraduate education.